Rangers have warned supporters they face lifetime bans from Ibrox if they bring the club into disrepute with offensive chants. The Championship leaders face Dundee in the Scottish Cup quarter-finals. 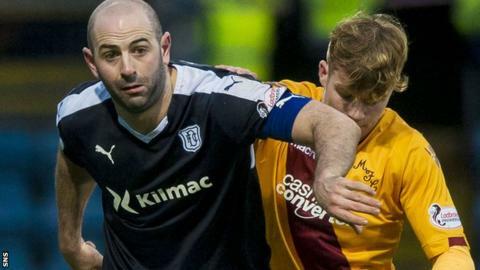 And they are concerned how some fans will react to comments made by Dundee captain Gary Harkins, who referred to them as a "new club" in reference to the liquidation of 2012. Rangers have asked supporters to "treat the ill-informed with silent contempt". Midfielder Harkins had later stated on his Twitter account that the comments to newspapers were "just a wee joke took too far". But team-mate Darren O'Dea, the former Celtic defender, had called last year for Rangers to be stripped of league titles won during the years the Ibrox club used Employee Benefit Trusts that led to an ongoing legal dispute with the tax authorities. "In light of recent ill-considered comments made by journalists and players, it is perhaps timely to point out that we must all continue to Follow With Pride," said Rangers in a club website statement. "Clearly it rankles with some that we, Rangers, are still here with our history intact and the best way to protect this proud heritage is to ignore our detractors. "Do not react to them and give others cause to criticise our behaviour. "Instead, Follow With Pride and deny those who cannot accept reality, or legal judgment, to examine their own mind sets." In January, the Scottish Professional Football League began an investigation into "unacceptable conduct" at Ibrox at the Rangers v Hibernian game on 28 December. The club had already condemned "a minority" for "inappropriate singing". Referencing their own Follow With Pride code of conduct, Rangers added on Friday: "Celebrate the club, its unbroken timeline, honours and achievements but do not sing any inappropriate songs. "Gestures and chants which are deemed offensive should also be avoided no matter the level of provocation and, while it is important to be aware Police Scotland, the SFA and SPFL can take action, remember also that this club enforces its own code of conduct. "Fans who behave in an inappropriate manner and who bring the club into disrepute will face punishment. "They might be given lifetime or limited bans, so please, let us all support Rangers in the correct way." Dundee manager Paul Hartley, meanwhile, is backing Harkins and O'Dea to cope with any flak. "They are old enough and experienced enough to handle the occasion," he said. "They have been there before. "Gary is the captain and hopefully he can bring a real captain's performance."